These things are notoriously difficult to define, but a good working definition I think is that science fiction tells a story in a universe exactly like our own but with different technology, and science fantasy tells a fantasy story using the traditional trappings of science fiction (aliens, space, lasers, etc). Basically, if it would make Asimov turn in his grave, it’s science fantasy. When the GW Studio were looking to transplant their fantasy miniatures game into a sci-fi setting, they naturally turned to science fantasy and thus Dune for inspiration. It has prophecies, heroes, witches, magic, monsters and sword-fights, but it also has lasers, atomic weapons and space-ships. I don’t think it’s an exaggeration to say that without Dune, early 40k would have lacked depth and had few reference points for fans besides those taken from Warhammer Fantasy Battle. The influence of Dune on 40k was varied, but probably the most obvious and minor influences were terminological. “God-Emperor” and “lasgun” for example were both originally Dune terms. But the inspiration was more subtle and deep than that. Every epic science fantasy/space opera needs to make an effort to explain how travel and communication works between planets in the galactic empire. Dune introduced the science fantasy trope of the Navigator, human beings who through the use of the magical Spice Melange can bend space with their thoughts. Over time the Navigators, who by the way are bred in semi-independant noble houses and are avid players in imperial intrigue, are slowly mutated to become inhuman creatures. Sound familiar? This “bending space with the mind to travel vast distances” thing is pure science fantasy, as is the GW re-working of the idea, traveling through a parallel hell-dimension. In 40k Navigators are born mutants, but other than that they are pretty much torn straight from the pages of Dune. A vast, ancient and semi-theocratic galactic empire. Within this empire, aristocratic houses continually struggle for power. A long-ago civil war that resulted in the outlawing of artificial intelligence. Magic, in the form of psychic abilities. High technology coupled with fanaticism, swords and superstition. Now all of these shared tropes may seem so commonplace as to be trivial, but remember that Dune was written in 1965 and at that time they were innovative and exciting. That’s why they were so attractive to the GW Studio designers back in the 1980s. So there you have it. I’m sure there are many other little Dune-isms in 40k, particularly in the older editions, but I’ll leave that up to you readers to discover. This entry was posted on Friday, March 11th, 2011 at 9:04 am	and tagged with Dune, fluff, Frank Herbert, Inspiration, Lore and posted in Unseen Influences, Warhammer 40,000. You can follow any responses to this entry through the RSS 2.0 feed. fantastic article! as my name would suggest (and its the name i use all over the web) i am a big dune fan, and its great to see someone give it the credit it deserves in terms of 40k lore. thanks! Thank you very much Atreides. I’m glad you liked it! Really interesting reads thus far. How did you come by this information? Just been following 40k lore for a long time? Thanks Purgatus. As to how I came by this info, I guess I’ve played 40k since I was about 10 or 11, and I’ve read a lot of old fantasy and sci-fi. I suppose I just have the sort of brain that remembers stuff I’ve read and likes to make connections. Back in the 80s though the psychopathic killer aspect of the marines was often emphasised, and that passage you quoted above does have quite a few similarities with the older descriptions of space marines. They weren’t always the shining space knights we love (or love to hate) today. Such a great post I had to go and watch the David Lynch film again, first time in years. Another connection for you, the Weirding Way (the film depiction not the books) of power words that can kill, very much like Enuncia, the unwords that manipulate the warp by vocalisation causing all kinds of damage. Mentioned in both Dan Abnett’s Ravenor & Prospero Burns novels. Thanks Bix. Yeah, that movie cops a lot of flak but I quite like it. The Baron scared the bejesus out of me when I was a kid! I remember that bit in Ravenor, it was a lot like the Weirding Way now that you mention it. I played 40k back in the early 90’s, but only recently started reading the dune novels (am on number 4 as I speak). The similarities are imposible to miss, GW obviously lifted so much material from it. BTW. The sci-fi channel miniseries’ are about a million times better than the crap David Lynch film, definately worth a watch. Yeah, I saw those a few years ago, they were good. Played 40k and read some of the Space Wolf Books a while back and halfway through Dune at the moment. I instanatly saw a lot of the thinks I recall from 40k in Dune. Not to mention the plasteel mention in the bunkers on Arrakis and the almost universal use of it in 40k. Didnt think of the Navigators. Some more subtle points would include the inital prescience of Paul when he sees a fanatical army led by his Fathers men with the skull of the Duke as their focus wearing dark green and carrying a Hawk emblem…Dark Angels? @Crotalidian, thanks for the input. That’s a good one about the plasteel, I forgot about that. As for a more official catalogue, I don’t know how much cross-over there is between the 40k and Dune fanbases. And I definitely don’t see GW doing anything to let people know where they got their ideas! In addition, the visual design of the David Lynch movie seems to have had a profound influence on the visuals of 40k. I saw Dune when it came out, but hadn’t seen it again until last year. I was amazed at how much that movie resembled the 40k universe as I had imagined it. I agree totally. Especially Rogue Trader, which really is, to me, a visual mash-up of Lynch’s Dune and 2000 AD. Except for the Eldar, who are Jes Goodwin’s particular and unique vision. 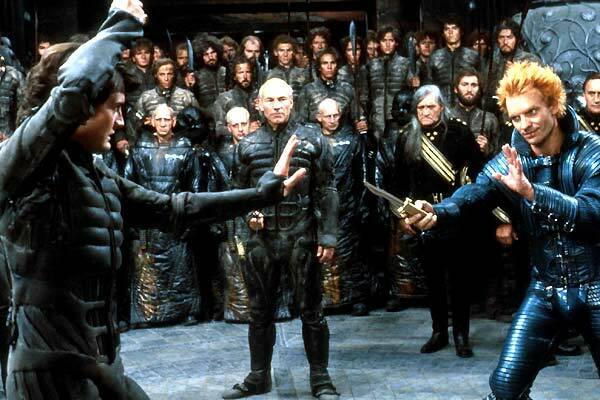 Excuse me, but the Lynch adaption of Dune is without a doubt, atleast IMHO, one of the greatest book-to-film translations atmosphere wise that has been done in film history, Closely followed by Boorman’s Excalibur. And that’s in spite of him inventing the Wierding Modules and taking some artistic liberties. Lynch is our times Weaver of Magics in cinema. The Rogue Trooper rules specifically mentioned Dune set pieces like ornothopters, lasguns and such in the introductory paragraph.